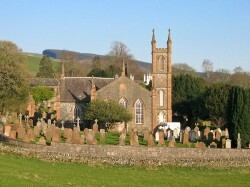 Glencairn & Moniaive Parish Church is a linked charge with Dunscore Parish Church and is within the Presbytery of Dumfries and Kirkcudbright. The parish of Glencairn & Moniaive is located at the northern end of the scenic Cairn Valley in mid-Nithsdale, which is part of the Dumfries & Galloway region of South West Scotland. The community is centred around the village of Moniaive. We aim to play an active part in the community we serve, reaching out with the love and joy of Jesus Christ. Our vision is ‘To convince all people of God’s love for them’. Our Minister, Rev Jannie du Plessis, retired at the beginning of February 2019. During the Vacancy, we welcome The Revd J Stuart Mill as our Interim Moderator. His details may be found on the ‘Contact’ page. In these turbulent times for our society and democracy, we understand why every opinion must be considered and why every vote counts. It matters to everyone, citizens and Members of Parliament alike. I hope and pray, as I’m sure you do, that whatever the outcome of Brexit, the peoples of the United Kingdom and the European Union will show respect and tolerance, exercise restraint and work collaboratively as the new political landscape emerges. We forget so easily, however, that the world humanity inhabits is but an infinitesimally small part of the time-space continuum, which our Scriptures describe as God’s Creation. Though scientific minds bring greater clarity to the evolving picture we have of the Universe, still there is an important role for people like you and me, who believe in the Creator and who love and honour God with grateful lives. It remains my fervent wish and prayer that together and by God’s grace, we can deepen our trust in God through worship, witness, service and study. As Easter approaches, may our hearts and minds be led by the Holy Spirit not only to a deeper understanding of Jesus’s agony and death on the Cross but also to a life-changing encounter with our Risen Lord. I offer you, your family and friends my prayers and Easter Greetings. It is true, the Lord has risen! He is risen indeed!